Up to this point, I have told you almost nothing about how to actually play. I have so far covered mainly the mindset you need to take into a game, not the tactics and strategies employed during a game. On this delicate subject, I will not even pretend to have unique authority, for it has been covered many times before me by more distinguished authors. Perhaps no author has ever explained it better than the military general, Sun Tzu. Twenty-five centuries ago in China, Sun Tzu wrote a little manual called The Art of War. In the 2,500 years since that time, countless authors have tackled the subject of war, and wars unnumbered have been waged, yet still Sun Tzu’s words have unnerving relevance. Mao Tse-tung’s Little Red Book of strategic and tactical doctrine was a nearly word-for-word recounting of The Art of War. It’s rumored that Napoleon’s secret weapon during his conquest of Europe was none other than Sun Tzu’s Art of War. 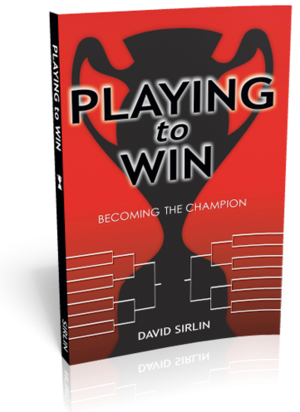 Even David Sirlin’s manual of competitive gaming Playing to Win is said to draw heavily from The Art of War. The chapters that follow in this book are my retelling and interpretation of that great work. I have condensed his thirteen chapters to seven, joined together similar material, omitted some topics, and added two chapters of my own. I explore how his tactics of military conduct apply to playing competitive games today, and provide examples from several games. I have taken great liberties on a few subjects such as the use of spies, but overall, the application of his concepts is quite direct. He will win who has military capacity, and is not interfered with by the sovereign. Now consider the application to competitive games of today. First we have “He will win who knows when to fight and when not to fight.” If, in a game, you are temporarily at a disadvantage, then you should stall until you can change the situation. Capcom vs. SNK 2 is a fighting game that allows players to store resources in a “super meter” and then activate this meter. Once activated, the resources give that player a big advantage, but only until his meter ticks down to zero over time. The opponent is well advised to avoid all fighting until the opponent’s advantage fades away. In a real-time strategy game such as Warcraft or StarCraft, opponents often gain momentary advantages of terrain, or concentration of troops, or even of the day/night cycle of the game. Don’t engage the enemy in fighting if delaying will allow you to find more favorable terrain, or gather your troops, or wait until a different point in the day/night cycle. Run away from a fight if you can simply wait for your disadvantages to fade. “He will win whose army is animated by the same spirit throughout all its ranks.” What Sun Tzu means is that the intent of the general must be carried out by officers and then soldiers, exactly as envisioned. The strategy is wasted if it cannot be executed properly. In a sense, your mind and your body must be “animated by the same spirit” while playing. You must have the dexterity and coordination to physically carry out whatever course of action your mind believes is best. From micromanaging combat units in a battle in Warcraft to executing a skillful backhand in tennis, to hitting your target with the rocket in Quake, to landing that difficult combo in Street Fighter, you must be able to execute your moves precisely. And then “He will win who, prepared himself, waits to take the enemy unprepared.” This is closely related to the first of the five points. Advantages shift over the course of a game, and it is the wise player who puts himself beyond the possibility of defeat and waits for the enemy to make a fatal mistake, or at least waits for advantages to shift favorably before attacking. For example, in the first-person shooter Counter-Strike, the players on the “terrorist” team must plant a bomb at one of two bomb sites on the map. The players on the “counter-terrorist” team must stop this from happening. The counter-terrorists can take up defensive positions using cover and protected snipers. When they have an iron defense in place, there is no need for them to scramble around the map looking for the enemy. If the terrorists do not plant the bomb before the match’s time limit is up, the counter-terrorists win. In this advantageous situation, the counter-terrorists can just wait for the terrorists to attack. The terrorists, on the other hand, need to shake up this situation before they can successfully strike. Two basic ways of doing this are to attack the bomb site that is underdefended, forcing the counter-terrorists to call for backup, or to use grenades (high-explosive, flashbangs, or smoke bombs) to cause a brief period of chaos and confusion in the enemy ranks. And finally the most interesting point: “He will win who has military capacity and is not interfered with by the sovereign.” Sun Tzu talks about the difference between civic virtues and military virtues. Humanity and justice are virtues of the state, but not of the army, he says. The army must be opportunistic and flexible. The state has principles to live by and precedents to set, but war is fierce and urgent. If you wish to win in battle, you must do immediately whatever is practical and effective. This is the entire point of Playing to Win. Do not be interfered with by the sovereign. If you wish to win, do not play to be looked up to and admired. Do not play to make a statement about this move or that tactic. Do not play to avoid being called “cheap.” Do not play to make friends with your opponent. Being friends with him is a civic virtue that you should indulge in after the match. During the match, you must harass him, annoy him, anger him, counter him at every turn, and surprise him when he is unaware. You must crush him. If you want to win, then don’t do it with one hand behind your back just because forces outside the game compel you to. Inside the game, there are only military virtues. If you want to win, then play to win.